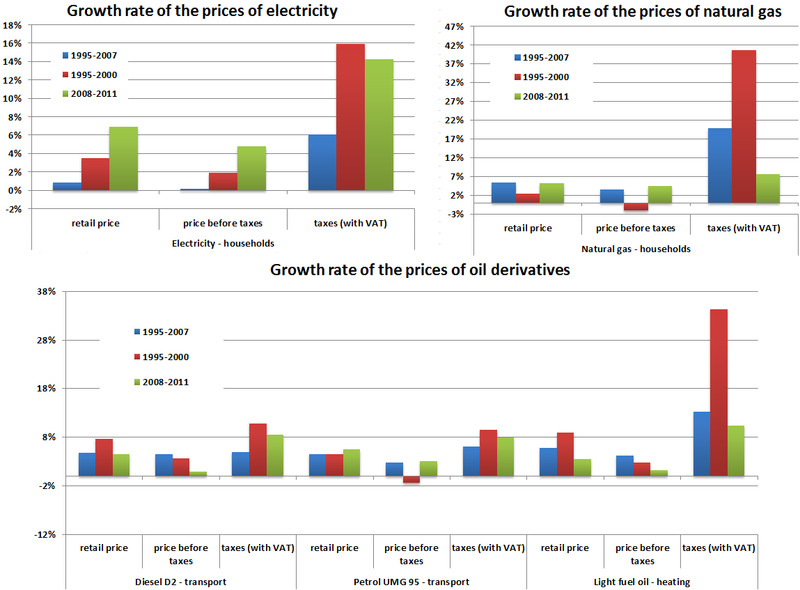 Prices of energy have increased over the period 2008-2011. In the same period, the most raised the price of electricity for households, in real terms by almost 23%, followed by natural gas for industry, 95 octane gasoline, natural gas for households, diesel D2, fuel oil and electricity for industry. 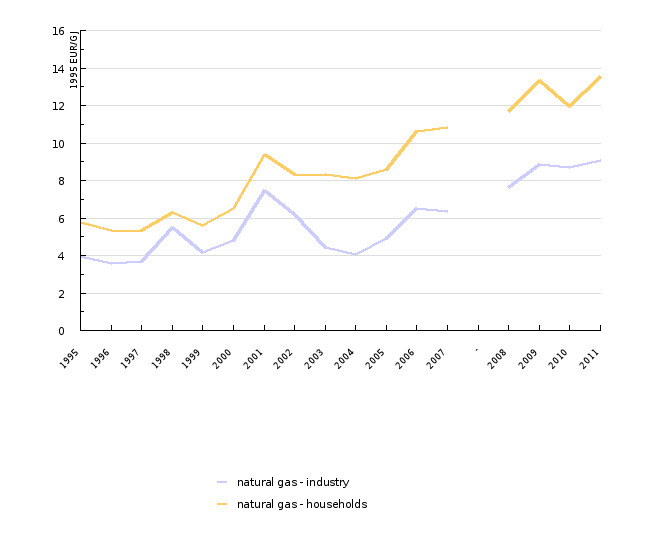 The Energy prices indicator shows the final prices of fuels reflecting the basic prices of fuels, including all taxes. 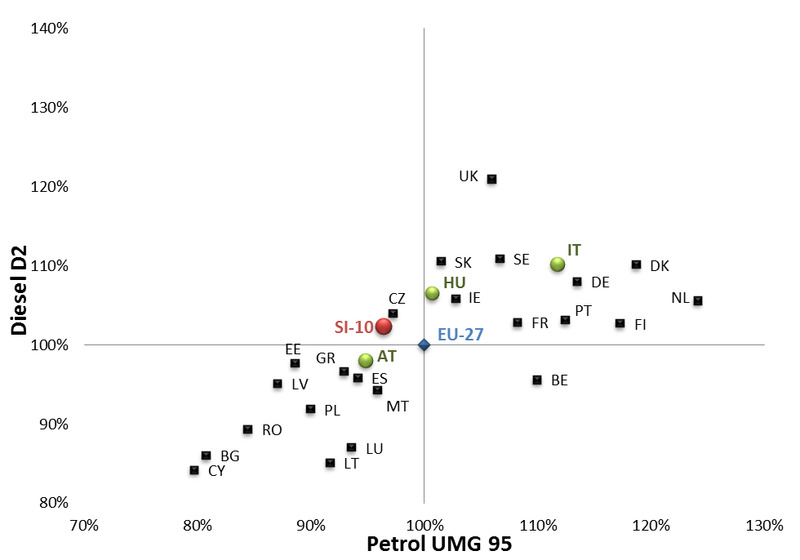 The prices for electricity are reflected in EUR per kilowatt hour (EUR/kWh), for natural gas in EUR per gigajoul (EUR/GJ), for liquid fuels in EUR per litre of fuel (EUR/l). Statistical Office of the Republic of Slovenia, 2012. 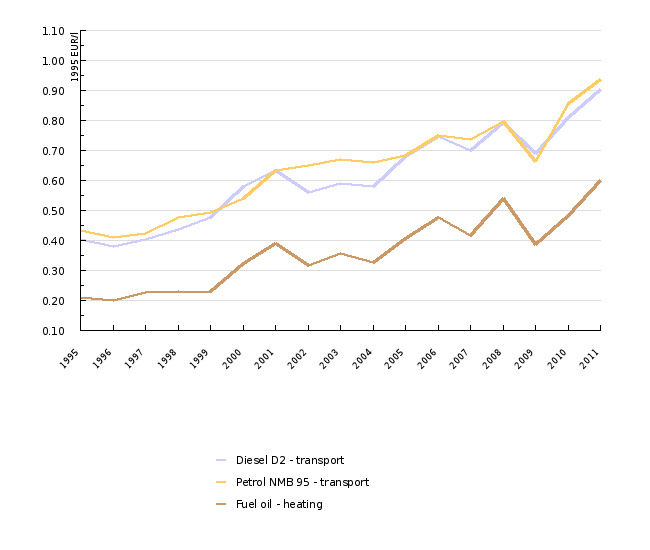 Eurostat, 2012; Oil Bulletin, 2012. Data source or database: The data on prices of energy products are published by SORS in the SI-STAT Data Portal > Environment and natural resources > Energy > Prices of energy sources for all consumer groups. Data administrator: Statistical Office of the Republic of Slovenia (Ema Mišič) and Eurostat. Data acquisition date for the indicator: 14 November 2012. In the Oil Bulletin database data on motor fuels are gathered weekly, with and without the taxes. Prices on January 4 are used for each country. Methodology of the data collection is described here. 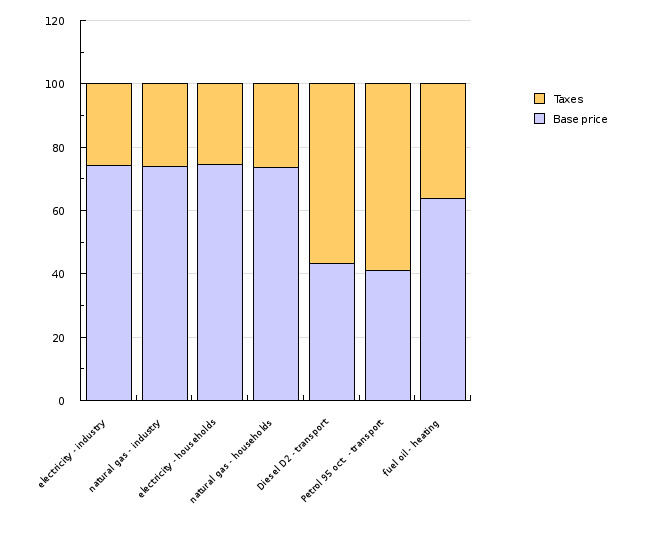 Weighted average prices for each country are used. 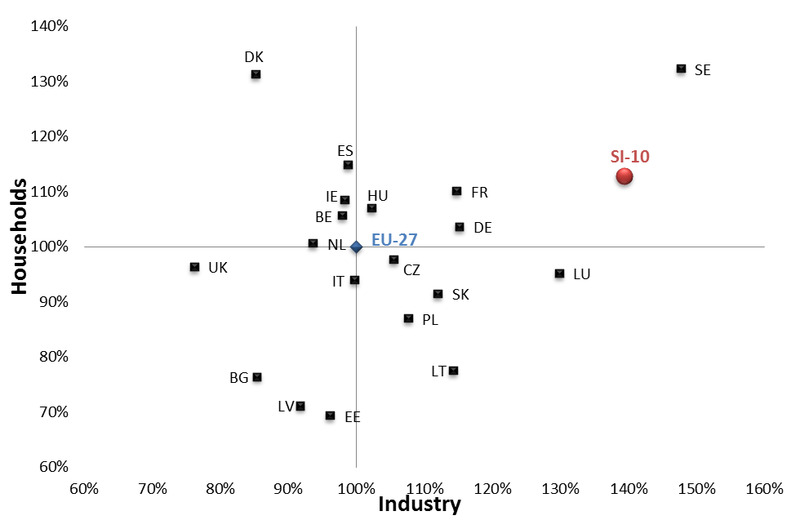 - Advantages and disadvantages of the indicator: The source of basic data for the entire time series for the petrol and diesel is Eurostat, which enables a more efficient and consistent analysis of individual sectors. 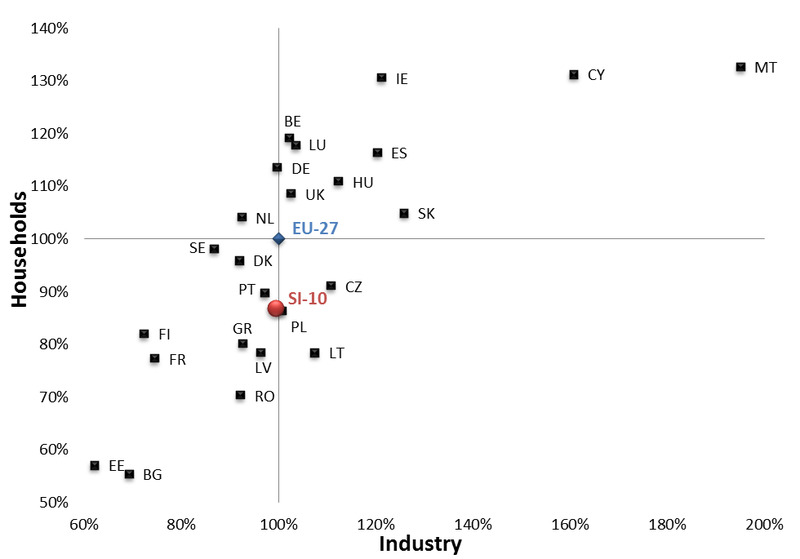 Uncertainty of the indicator (scenarios/projections): Prices and trends comparison among the EU member states very likely doesn't necessary reflect the reality due to differences in quality of the products and the structure of the fuel market. - AGEN-RS, 2012. Poročilo o stanju na področju energetike v Sloveniji v letu 2011.